Diabetes has reached epidemic proposition and almost 90% of type 2 diabetes persons are obese. Weight loss helps to reduce diabetes by almost 50%. There are some people who are just overweight or also normal weight but severely diabetics. 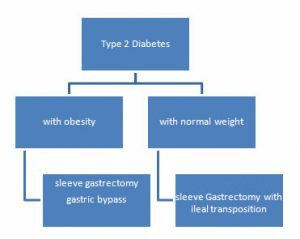 How laparoscopic surgery does helps to cure type 2 Diabetes? All these mechanisms are going to help to reduce blood sugar which will help to cure diabetes in 80% of patients and improves diabetes in remaining patients. procedures are chosen depending on whether a person is suffering from diabetes with normal weight or diabetes is associated with overweight. Here first stomach size is reduced to very small capacity by vertical stapled gastrectomy. The ileum, terminal part of small intestine of about 50 – 70 cm segment is transected and interposed in proximal part of intestine. This leads to early exposure of food to ileum resulting in rise of GLP which reduces sugar levels and causes permanent remission of diabetes. Patients can eat their favorite food.